*At present, we are only accepting E3Live Affiliate Program participants from the Continental USA, Hawaii, Alaska or Canada (who have end-user clients based in the USA or Canada). Submitting your application indicates you have read and agree to this and the following terms. The term of this Agreement will begin upon our acceptance of your Web Program application and will end when terminated by either party. Either you or we may terminate this Agreement at any time, with or without cause and with or without notice. You are only eligible to earn referral fees on valid online sales occurring during the term, while your account was in good standing. If your account is suspended for any reason, commissions will not be earned during the suspension period. If we suspect fraud or non-compliance with the following Terms, we reserve the right to suspend your account without notice. We may modify any of the terms and conditions contained in this Agreement, at any time and in our sole discretion, by posting a change notice or a new agreement on this site. Modifications may include, for example, changes in the scope of available referral fees, fee schedules, payment procedures and Program rules. IF ANY MODIFICATION IS UNACCEPTABLE TO YOU, YOUR ONLY RECOURSE IS TO TERMINATE THIS AGREEMENT. YOUR CONTINUED PARTICIPATION IN THE PROGRAM FOLLOWING ANY CHANGES THAT ARE MADE OR THE INSERTION OF A NEW AGREEMENT ON OUR SITE WILL CONSTITUTE BINDING ACCEPTANCE OF THE CHANGE. You acknowledge that you have read this agreement and agree to all its Terms and understand that we may at any time (directly or indirectly) solicit customer referrals on terms that may differ from those contained in the agreement or operate websites that are similar to or compete with your website. You have independently evaluated the desirability of participating in the program and are not relying on any representation, guarantee or statement other than set forth in this agreement. This Agreement will be governed by the laws of the United States and the State of Oregon, without reference to rules governing choice of laws. Any action relating to this Agreement must be brought in the federal or state courts located in Oregon and you irrevocably consent to the jurisdiction of such courts. You may not assign this Agreement, by operation of law or otherwise, without our prior written consent. Subject to that restriction, this Agreement will be binding on, inure to the benefit of and be enforceable against the parties and their respective successors and assigns. Our failure to enforce your strict performance of any provision of this Agreement will not constitute a waiver of our right to subsequently enforce such provision or any other provision of this Agreement. Commissions are paid on valid online orders and cannot be paid on refunded, cancelled, fraudulent orders, or orders from clients who are already under other existing distributors. Commissions are also not paid on orders placed by the affiliate from their own affiliate link or second-tier links (i.e. "self-orders"). Commissions cannot be earned during an account suspension. E3Live affiliate banners or links should not be placed on ad media sites such as AdEngage, AdsDaq, Adbrite and similar. E3Live affiliate banners are to be used on the website you indicate in the "URL" field in your Personal Profile (i.e. a website you own or your company owns), or on a page you own and have authorization to control the content of (i.e. a social networking page, blog, or your e-newsletter, for example). You shall not purchase or register keywords, Pay Per Click advertising, AdWords, search terms, domain names, or other identifying terms that include the word "E3Live" or E3Live's product names, ingredients, trademarked names,certain variations and misspellings thereof for use in any search engine, portal, sponsored advertising service or other search or referral service. Any affiliate doing this will be suspended and commissions will not be paid on this type of activity. If you have purchased or attempt to purchase or register keywords, Pay Per Click advertising, AdWords, search terms, domain names, or other identifying terms that include the word "E3Live" or E3Live's product names, ingredients, trademarked names, certain variations and misspellings thereof, you will need to cease this activity immediately. You may not, under any circumstances, purchase online ads via search engines or otherwise that show www.e3live.com as the url with your affiliate link behind it - this is impersonating our company and will result in account suspension. Online ads (i.e. Google Ads and similar) that clearly state your own url (see the following examples) are allowed as long as the viewer is clear that your url is the source of the ad, do not use "www.e3live.com" in the ad. Ads that are in violation are subject to flagging & removal by Google under the terms of their trademark infringement rules and may jeopardize your account standing with Google. E3Live is not liable for any action that Google decides to take against you or your account as a result of these violations, including but not limited to, Google account termination. 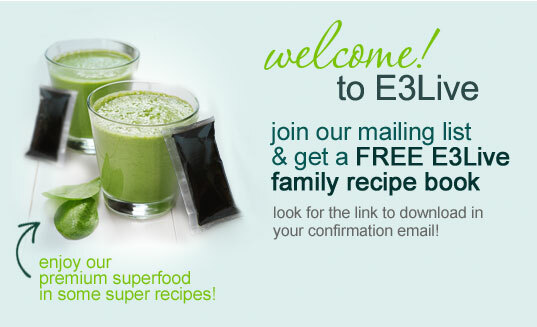 As an E3live affiliate/distributor/wholesaler, you are permitted to use content in good faith from our www.e3live.com website (photos, testimonials, recipes, etc) as long as it is for purposes of the promoting E3Live products. However, you may not "copy" the look of our site (design or code), replicate our site, use our Logo as a header, or otherwise use the same or similar design and layout of our site as your own. Your site needs to clearly be identified by the viewer as being yours, the viewer should never have any confusion as to whether they are on the official E3Live corporate page (owned and operated by E3Live) or not. In other words - your site should have a look & feel (design elements, layout, colors, etc.) that is distinctly different from that of www.e3live.com, but you may use our content on your site to promote E3Live products. By signing up to this program, Canadian affiliates agree and understand that at this time, ONLY online sales to the USA and select products into Canada (when available) will be tracked for commissions via this web affiliate program. We do not sell, trade or give away names, email addresses, phone numbers, any other addresses or payment information of our clients for any reason. Please do not ask for client contact information or email lists - we respect the privacy of our clients and they expect that we will uphold this policy on their behalf. Any violation or non-compliance to these Terms may result in account suspension, possible account termination, or other action deemed appropriate by E3Live at any time and at our discretion. No commissions are paid during account suspensions.